Converters DC There is 1 product. What are the DC / DC converter? The DC / DC converters are responsible for coupling different DC voltages to have elements of different voltages connected in the same installation. They can be a supplement to installation of domestic solar energy if your solar kit consists of various voltages you need coupled. 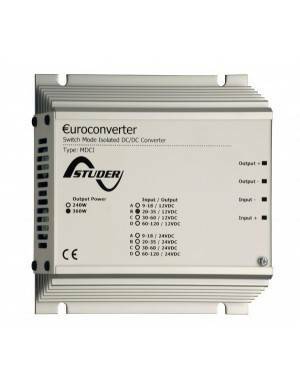 Converter DC/DC 100W insolate from 9-120 Vdc to 12-24Vdc Studer MDCI 100 A safe DC-DC converter for power systems in mobile applications, such as photovoltaic systems and isolated, caravanning, boating and emergency vehicles. Allow power a load such a 12V or 24V battery system or vice versa. For these needs, without these devices you need to convert energy dc to ac to 230 Vac and converted back to DC in the voltage needed. These converters are not elements widely used, because general practice is to properly size a solar kit to avoid having to use it, but it is typical in expansion of facilities or kit solar panels, with the aim of making elements of the old installation, when new needs make desirable DC coupling elements at different voltage. They are the only devices that allow us to coupling elements with different DC voltage (typically 12V with 24V or vice versa). Allowing the use of elements from different facilities or increase a facility without having to change the entire configuration of a solar kit, either by solar charger or by solar kit. 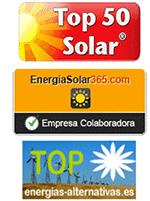 For uses such as photovoltaic systems, caravanning, boating or emergency vehicles.